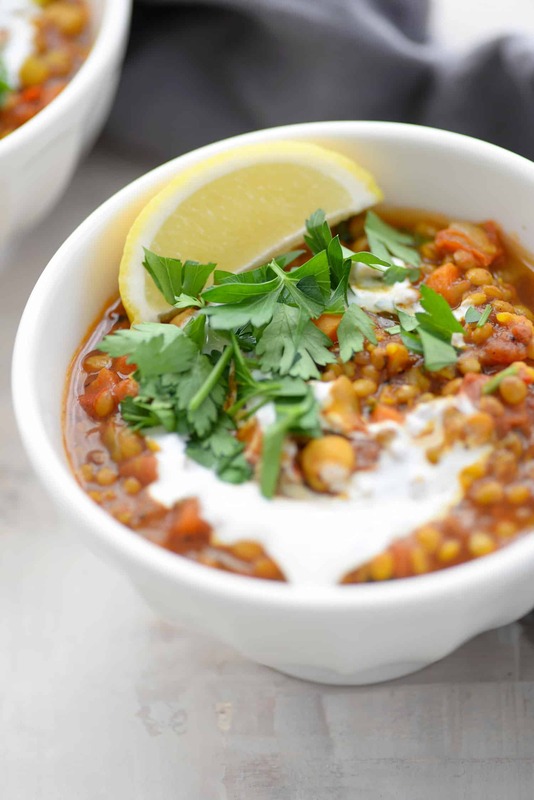 Sending a giant bowl of this nourishing soup your way! I figured it’s the least I could do with a three day weekend behind us and snow ahead in the forecast. We just got back from the most amazing week in Florida; a little get-away with my mom and Vander. I taught yoga at the resort and in exchange, we got to soak up the sun, relax and enjoy the most incredible food. Like I feel on most vacations, I was in my bubble. My phone was rarely near me, I checked my emails only in the evenings and I was able to finish two entire books by the pool. It was blissful to say the least. Van also went into the pool for the first time, which left me in happy tears. Gosh, I’m such a mess sometimes. I wasn’t sure what he was going to think of it, but the moment his little legs started splashing in the water and his face lit up in a goofy grin, I was gone. Tears coming down, my laughter only slightly louder than his belly ones. I know, it’s so silly. But, I think it was the combination of getting to witness this first experience and the glass of champagne that I had a lunch. OK. Enough talk on joyous moments in 70 degree weather. We are firmly back in St. Louis for the time being and there is snow on the ground and temperatures in the teens. Thankfully, I’ve got the perfect meal for you. 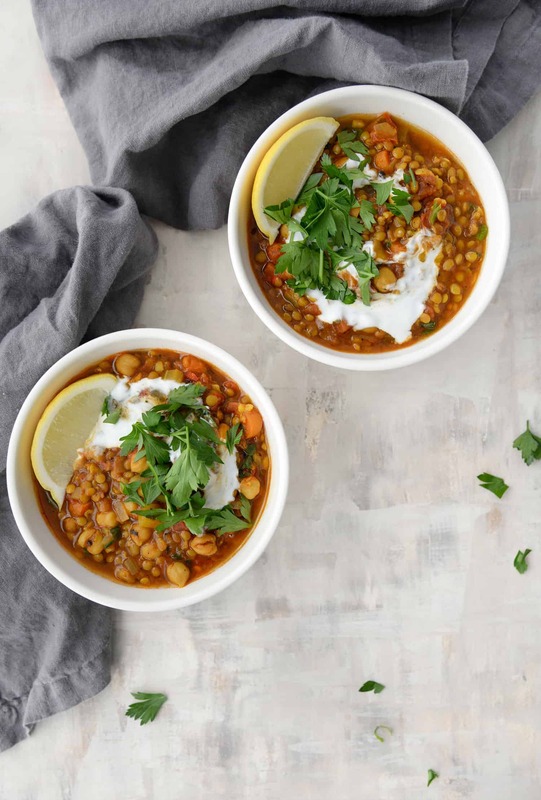 This Moroccan chickpea and lentil soup is from the new Mediterranean Table Cookbook, authored by the editors of Prevention and my dearest friend, Jennifer McDaniel. 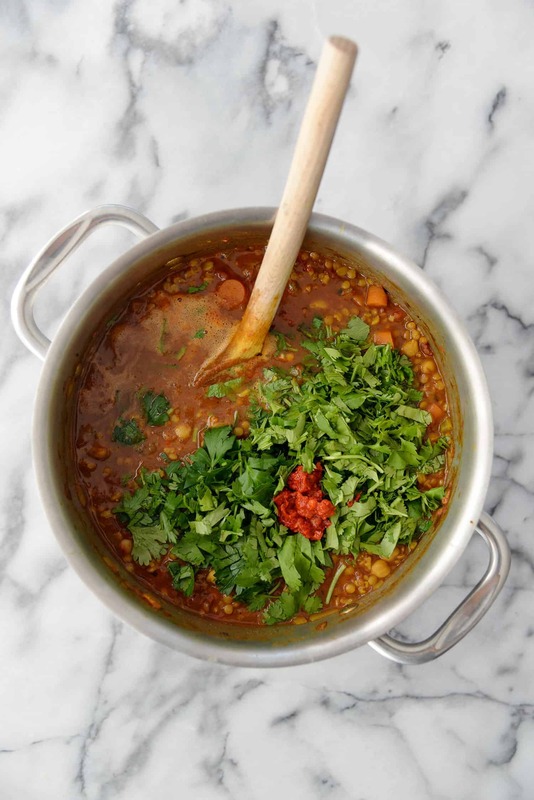 I swear this soup was made with me in mind, it’s got all of my favorite ingredients: chickpeas, lentils, brown rice, lots of fresh herbs and spicy harissa paste. The moment I opened her gorgeous cookbook, I knew I was going to be making this one. While I eat all foods, I would say that I loosely follow a Mediterranean diet pattern: lots of pulses (legumes, beans and peas), vegetables, whole grains, fruits with healthy fats and a side of protein. Um, and wine. That’s Mediterranean, isn’t it? If you are looking for a beautiful cookbook packed with delicious recipes and a complete step-by-step primer on the Mediterranean diet, please check it out. I’ve already made several of the recipes and they have all been winners. My favorites: blueberry lemon tea cakes, arugula salad with goat cheese, grapes and za’tar croutons, saffron couscous and turkish red lentil bride soup. And of course, this recipe that I’m sharing here today. Also, fellow mamas (and dads), Jennifer runs a community called McDaniel Family Eats– a free service that delivers menu ideas and a grocery list for the following week to your inbox every Friday. It’s dietitian and mom tested, so you know you are getting healthy, nourishing recipes that the entire family will like. Sign up here. This soup makes a ton, which is a good thing in my book. We enjoyed a bowl of it for lunch, then popped the rest in the fridge for easy lunches throughout the week. I then froze half of the batch for dinner in the coming months. However, this recipe easily halves, so feel free to cut back on the amount if needed. Don’t be shy about adding the harissa paste. The soup completely comes together once you add in the cups of fresh herbs, the spicy harissa paste and a generous squirt of lemon juice. I bought the harissa paste at Trader Joe’s, but you should be able to find it at well-stocked grocery stores, international stores or online. 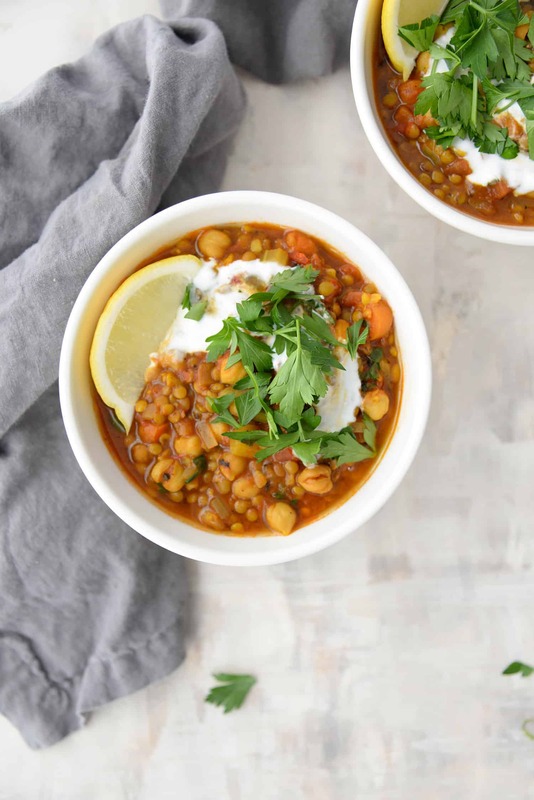 Moroccan Lentil and Chickpea Soup! If you like healthy, spicy food- you’ve gotta try this one out. 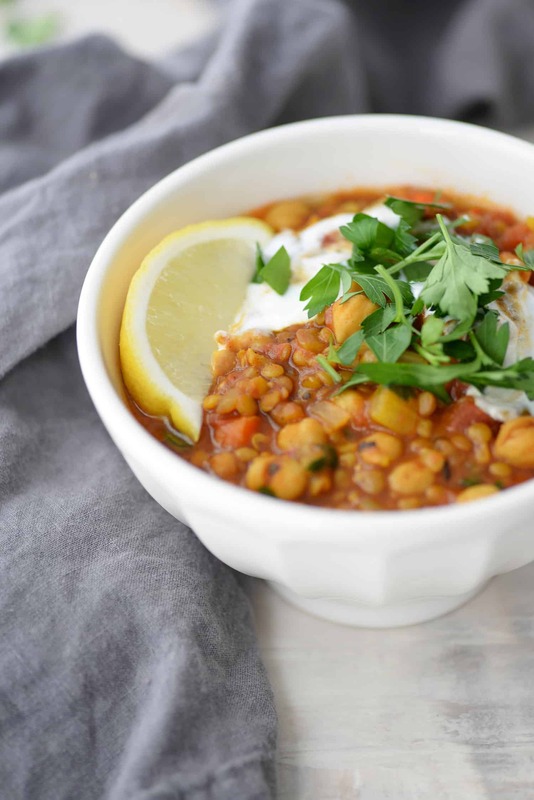 Lentils, chickpeas and brown rice in a spicy tomato and harissa broth. In a large soup pot over medium heat, warm the oil. Cook the onion, celery and carrots until the vegetables are tender and begin to take on color, 7-8 minutes. Reduce the heat to low and add the garlic, ginger, turmeric, cinnamon, salt, pepper and saffron. Cook, stirring constantly, until fragrant, 1 minute. Add the broth, tomatoes and rice. Bring to a boil, reduce heat to a simmer, cover and cook for 10 minutes. Add the lentils and chickpeas and simmer until the lentils and rice are tender, about 35 minutes. The soup is meant to be thick, but if it seems too thick, add water, 1/2 cup at a time, to reach desired consistency. Stir in the cilantro, parsley and harissa and cook for 5 minutes. Garnish each serving with more herbs, plus the lemon wedges. Hmmm yum! 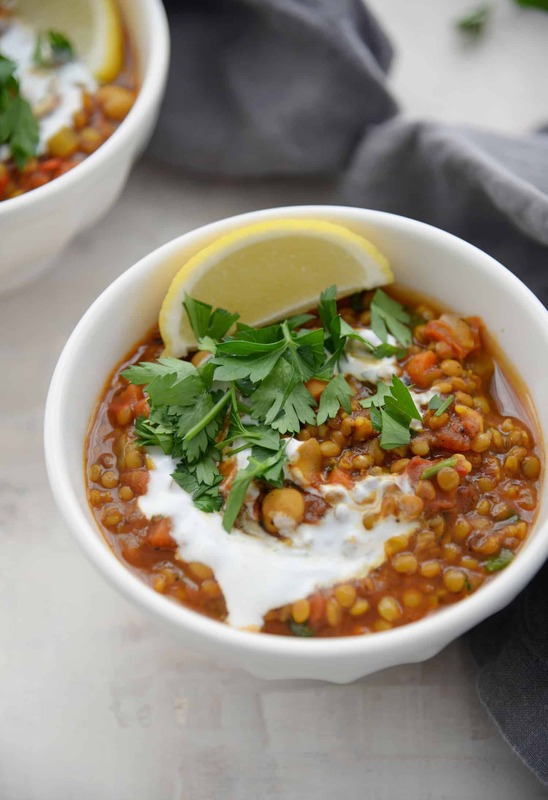 This Moroccan Lentil and Chickpea Soup looks sooooo delicious! Can’t wait to try this at home. My husband will love this.